The date of the extradition hearing for London speedboat killer Jack Shepherd has been set. Shepherd was convicted of the manslaughter by gross negligence of Charlotte Brown, but fled to Georgia in March before his trial started. The 31-year-old handed himself into Georgian police in January and was jailed for three months ahead of an extradition hearing. He will appear at Tbilisi City Court on Tuesday, said his lawyer. Shepherd was found guilty in his absence at the Old Bailey and sentenced to six years. Ms Brown, 24, was on a date with Shepherd when he took her out in his speedboat on the River Thames in December 2015. Shepherd and Ms Brown were thrown from the boat into the water. He was found clinging to the upturned craft near Wandsworth Bridge, while Ms Brown was found in the water 30 minutes after the capsize. 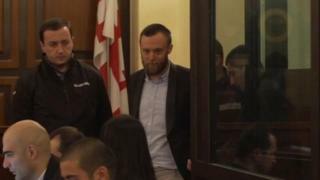 Shortly after Shepherd handed himself in to the Georgian authorities a judge ruled out any attempt to have him extradited to the UK quickly. On 1 March, Irakli Chilingarashvili, the head of the International Department of the Prosecutors Office of Georgia, told the BBC Georgian authorities had received an official request from the UK to extradite Shepherd. Shepherd's lawyer, Mariam Kublashvili, said the hearing was set for noon, local time, on Wednesday.